"The physical journey of any athlete can come with its challenges"
ST. PAUL, Minn.--(BUSINESS WIRE)--Recently retired basketball player Matt Bonner gave humorous “support” to FUTURO Brand’s new campaign, highlighting his quest to stay fit after retirement as he explores out-of-the-box fitness routines. The video launches alongside the brand’s larger “Brace for Adventure” campaign which speaks to the attitude of the “all-in” consumer, one who embraces life’s greatest adventures and takes advantage of FUTURO Brand’s premium line of braces and supports. 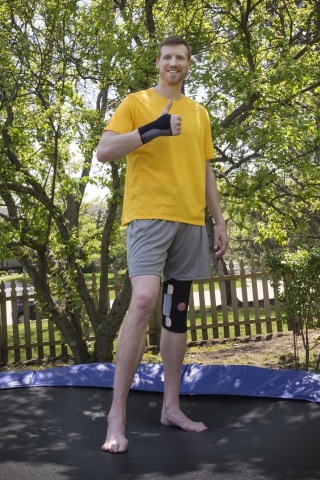 As part of the new campaign, Bonner, who has experienced his own bumps and bruises throughout his basketball career, humorously demonstrates how the proper support can keep you doing the activities you love – whether it’s basketball, break dancing or even trampolining. “We’re excited that our new campaign reflects an attitude of embracing adventure, of trying something new and seeing what’s possible. Matt Bonner embodies that “all-in” attitude. We loved that he shared his personal experience as an athlete, and of course his signature humor, to help tell our story and introduce new consumers to the FUTURO Brand,” said Marcelo Hengeltraub, global business unit manager for FUTURO Brand. FUTURO Brand products are designed to be the perfect accessory for those with an active lifestyle and an adventurous spirit. The new “Brace for Adventure” campaign is about breaking routine, trying something new and seeing what's possible. It starts with supporting your joints. Where it ends? That's for you to decide. View the creative. With its longstanding reputation for innovation in braces and supports, FUTURO Brand products have been supporting consumers as they brace for adventure for over 70 years. Designed in collaboration with their expert panel of engineers and medical professionals, products are thoughtfully engineered to provide support, comfort and fit while helping to relieve symptoms associated with sprains, strains, arthritis, muscle pain and injuries. FUTURO Brand products are available at CVS, Rite Aid, Target, Amazon and other retailers nationwide. Visit FUTURO.com to find a retailer near you. Onion, Inc. is a Chicago-based digital media company composed of America's Finest News Source, The Onion; pop-culture sister publication, The A.V. Club; internet culture satire website, ClickHole; creative services agency, Onion Labs; long form content studio, Onion Studios; and full-service production company, Onion Productions. Onion, Inc. is a part of the Fusion Media Group (FMG), a division of Univision Communications Inc. that caters to young, diverse audiences across a range of platforms and languages. FMG’s English-language properties include two cable networks, FUSION TV and El Rey Network, as well as a collection of leading digital properties: Gizmodo, Deadspin, Lifehacker, Jezebel, Kotaku, Jalopnik, Fusion, The Root, The Onion, The AV Club and Clickhole. FMG reaches over 92 million unduplicated monthly unique visitors (60% reach across 18-34) across its owned digital properties and partner network of sites. ©3M 2017. 3M and FUTURO are trademarks of 3M.